NATIONAL HONORS: Ten weeks of research and reporting went into “Forgotten 4-year-olds,” Bridge’s look at problems in Michigan’s early childhood system. This week, the Education Writers Association honored the series and its writer, Senior Writer Ron French, with a first prize in investigative reporting for a magazine. 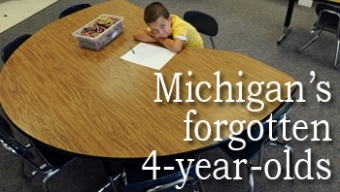 Bridge Magazine has been awarded a national journalism award for its series, “Michigan’s forgotten 4-year-olds,” which exposed shortcomings in the state’s preschool program. The National Education Writers Association awarded Bridge Magazine Senior Writer Ron French first prize for investigative reporting for the series, which revealed how underfunding, logistical hurdles and competition between programs kept 29,000 Michigan 4-year-olds out of free, state-operated preschool that they were eligible to receive. The series helped spark efforts by Gov. Rick Snyder and legislative leaders to increased funding of the Great Start Readiness Program. French joined CFM and Bridge in July 2011, after having won more than 40 national and state journalism awards at the Detroit News. The Children's Leadership Council of Michigan, which is asking the Legislature to approve Snyder's proposal to add $65 million per year over the next two years to early childhood accounts, also praised French's work. "Ron French's deep look into preschool delivery and funding puts the faces of real ochildren and parents on an important policy issue. His series played a significant role in calling attention to our underinvestment in public preschool in Michigan, which Gov. Rick Snyder has addressed in his executive budget proposal," said Doug Luciani, co-chair of CLC and president of the Traverse City Area Chamber of Commerce.